ONLY the parents of athletes and the athletes themselves may pick up their packets. You may not pick up a friends packet. ​Parents and Guardians, please bring a photo ID when you come to packet pick-up. Race Numbers. The race packet will include a race bib and two adhesive numbers. The race bib, or number, must be displayed during the run and does not have to be worn during the bike. The best approach is to use an elastic race belt. The number may also be pinned to the front of a shirt. Attach one adhesive number to the top tube of the bicycle, visible from the right side. Attach the other to the front of the bike helmet. These will help ensure that athletes use the correct bicycle and helmet during the race, and that these items are returned to the correct athlete after the race. Swim Cap. 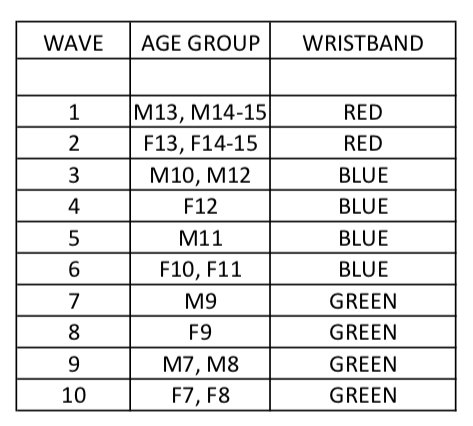 Your race packet includes a swim cap labeled with your wave number. If there is more than one athlete in your household, please take care not to switch them. They will be used to ensure athletes are in the proper starting group (i.e., “wave.”) before the race. Race Course Map. Athletes should review the course map prior to the race. We will be conducting 3 race distances simultaneously. Volunteers will direct athletes, but athletes are also responsible for knowing the race course. The map will be displayed near the transition area and can be found on this website. Bike Requirements. For safety reasons, athletes will not be allowed to race with missing handlebar end plugs. If bar end plugs are missing, please visit a local bike shop to obtain replacements prior to race day. Per USAT youth supplemental rules bikes must not have aero-bars, disk wheels or training wheels. Helmets. Helmets must be worn – with straps fastened - by all athletes when on their bikes at the race venue, including before, during and after the race. Helmets must be certified by the US Consumer Products Safety Commission (CPSC) for use on bicycles. Certification can be found on a sticker inside the helmet. Time-trial or “aero” helmets are not permitted. For helmets to do their job, they must fitted and worn properly. Two common problems are wearing the helmet too far back on the head and leaving the chin strap too loose (above). Either situation could increase the chance of a head injury in the event of an accident. When the helmet is fitted correctly, the chin strap will be snug but not tight and the helmet will be over the forehead, approximately level on the head. ​Plan to arrive between 6:00 and 7:00 AM. The race venue is located 1.2 miles east of Portofino Island Resort. You MUST arrive before 7:30 AM, as we will be closing roads, making it impossible to drive to the race site. Parking is just east of the venue. Please do not park on Hwy 399 as this will be hazardous for athletes. Please limit the number of vehicles as we expect to fill the parking lot. Athlete Check-In After arriving, athletes will enter a “chute” for (1) a bike safety check, (2) body marking (race number on shoulders, age on right calf), (3) a colored wristband, and (4) a timing chip. Timing chips will be used for electronic timing of the race. Attach this to the ankle right away to avoid mixing them up with any other athlete. Volunteers will assist athletes in setting up his or her transition area. *Athletes will gather in waves under signs indicating their wave number. Emergency Considerations (IMPORTANT). If the emergency contact that you provided during registration will not be at the event (but say, “Grandma” will be there), please provide updated information at the registration table. If your child requires medical attention in any way, or is in any distress, we will attempt to contact you at the emergency number provided. Abandoning the Race. If an athlete chooses not to start after placing his or her bike in transition, they must notify transition volunteers. An athlete’s bike that remains in transition after all swimmers have completed transition will be interpreted as indicating that a swimmer is missing. The awards ceremony will take place as soon as results are available. Recovering your bike and departing. The transition area will re-open after the last athlete has completed transition. For security purposes, athletes must be present with their race number and body markings to remove a bike from the transition area. Vehicles may not leave until roads are re-opened at about 9:30 AM. Protecting the Environment. The beach is ecologically sensitive. Sea turtles, our namesake, can be harmed by trampling of nests, which are impossible to see. Similarly, dunes are living “organisms”. Trampling them degrades them. Please do not walk on dunes or allow children to play on dunes. Please stay on paved surfaces, the beach, wooden flyovers or other established paths. Please assist us by not littering and by recycling plastic water bottles. We aim to leave the race venue cleaner than we found it!